There’s always an opportunity to visit Carbis Bay Estate and enjoy the comfort, exceptional service and warm welcome of our staff. What’s more, we offer a range of special offers and breaks. If your travel dates are flexible, why not call our reservations team who can help you find the best value package for your stay? Gather the family together for an Easter to remember and enjoy a delicious three course Easter Sunday Lunch in our 2-AA Rosetted Sands Restaurant. A favourite with our guests! Enjoy Champagne and chocolates in room on arrival, dinner, bed and Cornish breakfast. 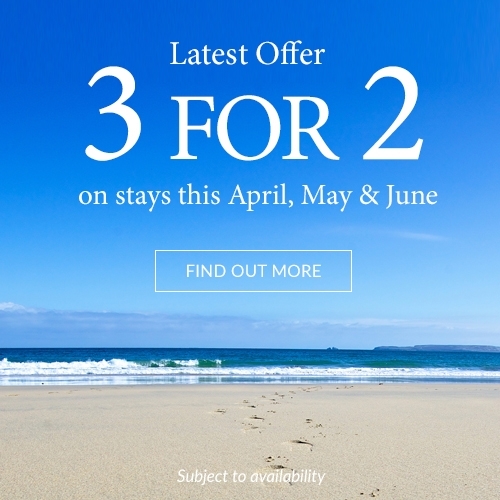 Come to Cornwall for a two, three of four night break by the ocean. Come to Cornwall this Easter and enjoy a break by the ocean. Dine at our Sands Restaurant for Easter Sunday Lunch and enjoy some much needed R&R on the Cornish Coast. Sample the best of Cornish produce across three different Estate restaurants on this Gourmet Escape. Head to the Cornish Coast to relax and rejuvenate. Includes accommodation and an Aromatherapy Associates treatment of choice.